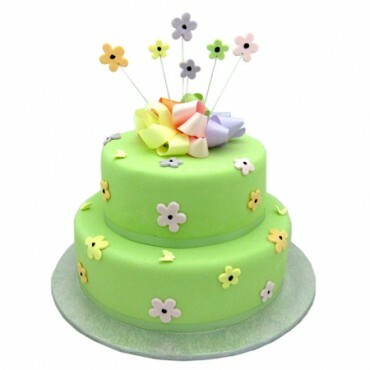 This two-tiered cake blossoms is fully iced in mint green and surrounded by colourful handcrafted sugar blossoms. This stunning two-tiered cake is fully iced in mint green. Surrounded by colourful handcrafted sugar blossoms, it presents itself as a bright and modern design. This lovely cake is decorated with a green satin ribbon to the bottom of both tiers and gorgeous colourful sugar blossoms on wires coming out of a colourful pastel satin bow in matching colours.